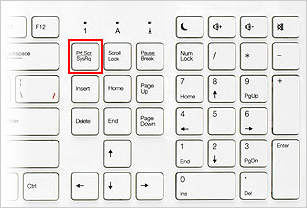 Press the Print Screen button on your keyboard (sometimes it is called PrtScn, PrtScr, or PrtSc) — this copies a picture of the entire screen to the clipboard. To make a screenshot of only the active window, press Alt + PrtScn. Note. In Windows 8, you can press Win + PrtScn to quickly make a screenshot of the entire screen and automatically save it in the Screenshots folder in your Pictures library. Open any image editor, such as “Paint”: Start → All Programs → Accessories → Paint. In the menu, choose Edit → Paste (Windows XP and Windows Vista) or click the Paste button in the program's home menu (Windows 7 and later). Note. You can also use the universal shortcut Ctrl + V.
The picture will be inserted in the image editor from the clipboard. If necessary, add text or highlight separate parts of the image. Save the screenshot on your computer: File → Save As; or click . Note. We recommend saving image files in JPG or PNG format, because this will give you the best file size for sending by email. To choose the file format when saving in “Paint”, select it in the File type box (at the bottom of the Save as window). The “Windows Snipping Tool” lets you make a screenshot of any part of your desktop or the entire screen. This program is launched from Start → All Programs → Accessories. Launch the program from the Start menu: type Snipping Tool in the search box and click the name of the program. In the program window, click the New button and select the desired area: a rectangular or free-form shape, a separate window, or a full-screen capture. In the editing window for the resulting image, you can write something using the Pen tool, or highlight text with the Highlighter. Save the image: click the Save As button and choose where to save the file. To make a screenshot in Mac OS, press ⌘ Cmd + Shift + 3. A file with a full-screen capture will appear on the desktop. If you want to make a screenshot of a specific part of the screen, press ⌘ Cmd + Shift + 4 and select the desired area of the screen using the cursor. To make a screenshot of only the active window, press ⌘ Cmd + Shift + 4 + Space. To save the screenshot to the clipboard, hold down the Ctrl key when creating it. The iOS platform allows making a screenshot with standard tools starting from 2.x versions. To make a screenshot, press and hold the Sleep/Wake and Home buttons together. Your screenshots are saved in the standard Photos app. There are different ways to make a screenshot on a mobile device with Android, depending on the device manufacturer and the platform version. Your screenshots are saved in the standard Gallery app. Press Volume Down and Power together and hold down for a couple of seconds. Press the Recent programs button and hold it down. Versions 2.x and earlier of the Android platform do not support taking screenshots using standard tools. You need to use third-party apps installed from Google Play. Press Home and Power or Back and Home (depending on the device) and hold them down for a couple of seconds. Press Home and Power together and hold down for a couple of seconds. The Symbian platform does not support taking screenshots using standard tools. You need to use third-party apps. For example, you can try Best Screen Snap. To make a screenshot, press and hold the Menu and Block buttons together for a couple of seconds. The screenshot will be saved in the internal memory in the My files → Pictures folder.